Where are my calendars saved, and how do I access them? Your calendars are automatically saved in the Calendar Builder's free online storage. This means that you are able to access your calendars at any time, from any computer, while you have an internet connection and an active activityconnection.com account. 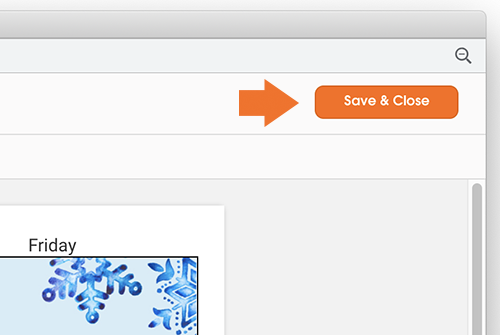 For peace of mind while working on your calendars, there is also an orange Save & Close button located in the upper right corner of the Calendar Builder window. To access your saved calendars, simply connect to the Calendar Builder. From there, you will see My Calendars on the left-hand side of the screen. Once you select My Calendars, your calendars should display in the dashboard to the right, where you can sort them by month, last modified, or from A to Z.